Wesley So, the champion of the Sinquefield Cup 2016 holds out his trophy. Wesley So is the winner of the Sinquefield Cup 2016. Wesley So is sharing jokes with former world champion Garry Kasparov at the awarding ceremony of Sinquefield Cup 2016. The trophy for the champion and the prize money represented by the check for the champion of Sinquefield Cup 2016. 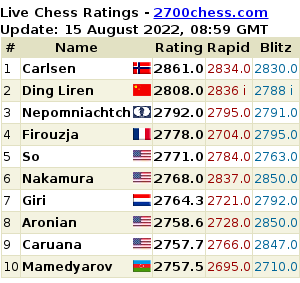 These are GCT (Grand Chess Tour) points earned by each player from the last three legs and the total GCT points. Prize money is the total prize earned so far from the tour. * Considered as wildcards for the tour.